Liquefied gas tank monitoring is important in maintaining safe storage and transport of gases converted to liquid form. We offer the digital scale indicator to use with industrial scales for monitoring liquefied gas levels. Cooling gases converts them into a liquid state that is easier and safer to store and transport. Some gases liquefy at normal atmospheric pressure while others require artificial pressurization to complete the liquefaction process. Common types of gases converted in this way are liquefied natural gas (LNG), liquefied petroleum gas (LPG), liquid oxygen, liquid nitrogen and liquefied chlorine. Other types of liquefied gases include alkenes, ammonia, carbon dioxide, fluorocarbons, hydrogen iodide, hydrogen bromide, hydrogen sulfide, nitrous oxide and sulfur dioxide. Heat applied to liquid or liquefied gases converts them back into the gaseous state at the vaporization temperature, which depends on atmospheric pressure. One of the problems in finding adequate storage monitoring equipment for liquefied gases is that pressure alone is insufficient to determine the amount of gas left in the storage container. If liquefied gas vaporizes, the pressure in the container decreases markedly. For this reason, storage tanks for liquefied gases, whether above or below ground level, have insulation and other measures designed to prevent evaporation of the contents. Accurate liquefied gas tank monitoring equipment must consider pressurization, temperature and other factors that can influence the equipment’s sensors. Liquefied gases play a part in many applications including power generation, refrigeration, cleaning and welding. Many of these gases are flammable and/or toxic. For this reason, proper storage of these gases is essential. Leaks will result not only in monetary losses, but also in many cases they can cause hazardous or even disastrous events. An LPG leak, for example, can lead not only to serious explosions and fire, but the combustion of the gas releases toxic carbon oxide (CO) into the air. Possess an alarm system that notifies the monitoring team when the tank reaches a specified weight. The alarm alerts the operator of possible hazardous situations due to excessive concentration and signals when the tank is empty when transferring contents to other storage. By using an alarm, the operator is free to perform other tasks. A digital storage system for saving results for later analysis. Connectivity that allows the electronic scales to transfer data to computers and other devices using various types of ports. Power backup in case of main power source failure. Durable and reliable construction and engineering since equipment failures can have dire consequences. Many industrial scales are suitable for liquefied gas tank monitoring, but they need additional equipment that will monitor special factors involved with storing liquefied gases. We offer The Digital Indicator for Industrial Scales which allows proper monitoring of intermittent levels and percentages needed to gauge the actual amount of liquefied gas in the storage tank during a specific period. LCD display providing clear readouts in a variety of ambient light conditions. The display is large enough to read at a distance and provides the option of weights in pounds or kilograms. The indicator also uses easy push-button controls rather than outdated knobs, dials and switches. A computer software system that allows for easy organization of data for storage, retrieval, comparison and analysis. 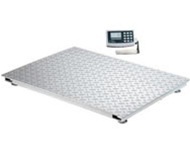 An alarm system that allows the user to set maximum or minimum weight limits. Connectivity to personal computers and mobile devices. The Digital Indicator is compatible with Arlyn Scales like the Series 6200 Industrial Bench Scales. These quality scales have stainless steel loading cells and utilize high precision strain gauge weighting technology. Available in 15 models based on size, capacity and resolution with the 2x versions (Double Accuracy) providing a higher degree of precision. The 2x models cost a bit more but they give that added accuracy needed to avoid possibly costly or dangerous situations that can arise in the storage of liquefied gases. A leading designer and manufacturer of high quality technology, Arlyn Scales has offered electronic scales for more than 30 years. We are based in Long Island, New York. We provide customers with innovative, reliable products of outstanding value. We treat our customers with the respect they deserve and do our utmost to provide solutions that perfectly match their needs. Our products are US-manufactured and sold factory direct at prices that are generally lower than industry standard. If you need superior quality monitoring equipment for liquefied gas tanks, please contact us today to discuss your needs with one of our professional representatives. After they analyze your requirements, they can suggest you the best possible options. To contact us, please call our toll free number, 800-645-4301, from 8:00 am to 5:00 pm Eastern Time, Monday through Friday. Our fax number is 516-593-4607. Our technical teams are ready to provide the right solution for your needs, so please contact us today to get started!